Free version has limited functionality, but this is enough to edit .PDF files. When you open the file you will see highlighted text. You can edit these text fields. Blue highlighting will not appear when you print, you can see it only in the editor. At the top of the program you will find a toolbar. Choose “arrow” to edit the text. Advanced settings allow you change the font, color, paragraph formatting, etc. To see the panel for advanced editing, press CTRL + E (Windows) or CMD + E (MAC) on the keyboard. To edit a page for home printing, where placed several cards on a sheet, you just need to edit one of them, the other cards will automatically accept the changes. Cick “File” –> “Save As…” and select the place where you want to save the file. I recommend save the file under a new name so that you always have the original version. Done! Now you can printing. If you print at home, please don’t forget to enable “borderless printing” in the settings of your printer (or software to operate the printer) because otherwise part of the design may be cropped. 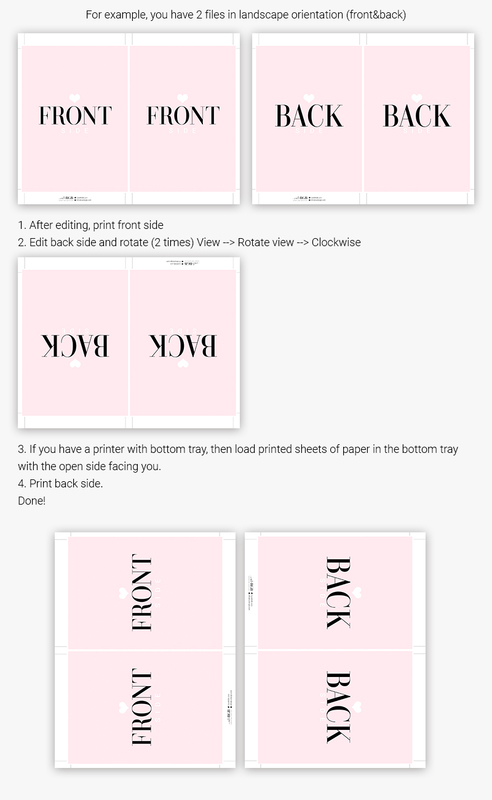 Print the sheets, then paste them back into the printer and print the back side. Depending on the type of paper feed of your printer (the bottom tray or top) you will need to flip the sheets. If you’re printing designs that are located in the landscape orientation, then before printing you should turn the sheet in adobe reader. I also recommend to choose the right paper. For example for business cards, invitations, loyalty cards – choose paper 80 lb & 100 lb cover weight. To cut the printed sheet you need to find the crop marks place a ruler (preferably iron) and cut the sheet using the cutter or scalpel for paper. A special cutting mat will also help to facilitate the process. That’s all. I will try to tell more about this in future articles. If you have any questions, you can ask them here in the comments.